Canada has joined three WIPO treaties that promote the worldwide use of trademarks, giving a boost to Canadian brand owners as well as consumers and underlining Canada’s strong multilateral engagement with the World Intellectual Property Organization. 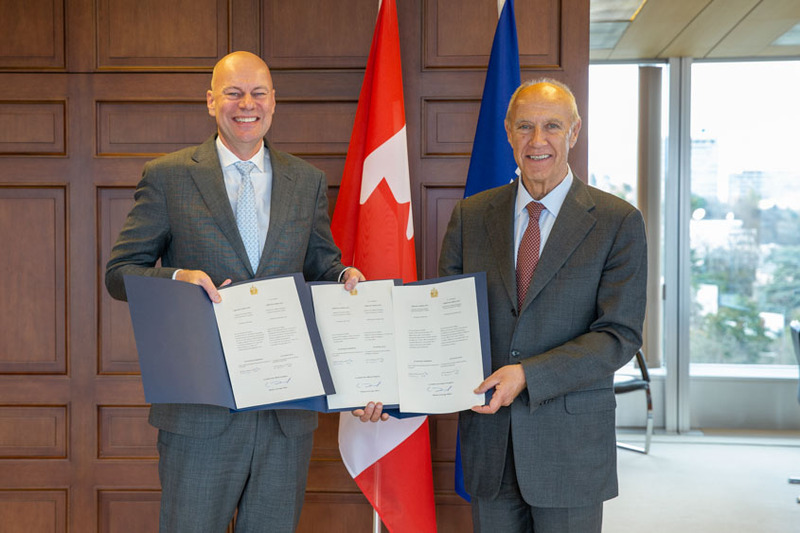 WIPO Director General Francis Gurry received Canada’s instruments of accession to the Madrid Protocol, Nice Agreement and the Singapore Treaty from Canadian Ambassador Stephen de Boer, Permanent Representative to the World Trade Organization. The treaties will enter into force for Canada on June 17, 2019. “Canada is proud to be depositing with WIPO the accession instruments to three international trademark treaties. By joining the Singapore Treaty, the Madrid Protocol and the Nice Agreement, Canadian trademark owners will have access to more efficient means of protecting their trademarks in various jurisdictions around the world. Aligning our trademark regime with other jurisdictions will lower the cost of doing business in Canada to the benefit of both Canadian businesses and those looking to invest in Canadian markets,” said Ambassador de Boer. By joining the Madrid System for the International Registration of Marks, Canada became the 104th member of the Madrid System, which now covers 120 countries. The Protocol will enter into force for Canada three months after the formal date of accession. Starting June 17, 2019, brand owners in Canada can begin using the Madrid System to protect their marks in the 120 territories of the System’s other 103 members by filing a single international application and paying a single set of fees. With its straightforward designation process, foreign companies and trademark owners can seek trademark protection through the Madrid System when selling their products and services in Canada. The Madrid System is a key component of protecting marks internationally, offering a convenient and cost-effective solution for brand owners worldwide. The Nice Agreement establishes a classification of goods and services for the purposes of registering trademarks and service marks (the Nice Classification). Canada becomes the 86th member of the Nice Agreement. The trademark offices of member states must indicate, in official documents and publications in connection with each registration, the numbers of the classes of the Classification to which the goods or services for which the mark is registered belong. Each contracting party to the Nice Agreement applies the Nice Classification in connection with the registration of marks and has to include in the official documents and publications relating to its registrations of marks the numbers of the classes of the Classification to which the goods or services for which the marks are registered belong. The Singapore Treaty harmonizes administrative trademark registration procedures among its members. Canada’s accession brings the number of contracting parties to 48. Building on the Trademark Law Treaty of 1994 (TLT), the Singapore Treaty has a wider scope of application and addresses more recent developments in the field of communication technologies. The Singapore Treaty applies generally to all marks that can be registered under the law of a contracting party. Most significantly, it is the first international instrument dealing with trademark law to explicitly recognize non-traditional marks including non-traditional visible marks, such as holograms, three-dimensional marks, color, position and movement marks, as well as non-visible marks such as sound.